NEW YORK Tax increases. Rising gas prices. Political dysfunction in Washington. None of that kept Americans away from auto dealer showrooms in February as General Motors (GM), Ford (F) and other automakers posted strong sales gains. Industry analysts expect last month's sales to be up about 7 percent from a year earlier as pent-up demand and cheap financing kept the U.S. auto sales recovery powering along. But while sales for 2013 are expected to top last year's, monthly increases are likely to be smaller than the double-digit gains the industry posted during the last two years as sales recovered from historic lows in 2009. Ford to boost small-engine production, add jobs in U.S.
GM sales rose 7 percent, while Ford's increased 9 percent. Chrysler and Volkswagen also reported increases, but both slowed from the torrid pace of the past two years. Chrysler sales were up 4 percent over a year earlier, while VW sales were up 3 percent. Toyota sales were up just over 4 percent. GM's sales were the best since February of 2008, led by the Chevrolet Silverado pickup with an increase of 29 percent. Kurt McNeil, the company's U.S. sales chief, said the recovery in new home construction is helping to boost the economy and pickup sales. When home construction thrives, businesses tend to invest more to replace vehicles. The average age of a U.S. pickup truck is just over 11 years. Ford also reported strong sales of its F-Series pickups, up 15 percent. The company also posted record February totals for the Escape SUV and Fusion sedan. Fusion sales were up 28 percent and Escape sales rose 29 percent. Together, the Escape and Fusion made up more than a quarter of Ford's monthly sales. Ford also said it plans to increase North American production by 9 percent in the second quarter compared with the second quarter of 2012. At Chrysler, which reported a 21 percent sales increase for all of last year, the growth slowdown was expected. CEO Sergio Marchionne has warned that first-quarter sales would decline, largely because the company stopped making the Jeep Liberty midsize SUV as it prepares a factory in Toledo, Ohio, to build a replacement model. The new Jeep Cherokee is expected to hit showrooms in the summer. Still, the company reported its 35th-straight month of year-over-year sales gains. Volkswagen reported its best February since 1973, but sales were far off the pace of VW's 31 percent increase last year. Toyota reported strong sales of the RAV4 small SUV and Avalon large car. Auto industry analysts say that higher Social Security taxes, rising gas prices and debate in Washington over government spending cuts weren't enough to keep buyers away from showrooms. "I think these little speed bumps aren't big enough to slow down the momentum right now," said Jeff Schuster, senior vice president of forecasting for LMC Automotive, an industry consulting firm. People need to replace aging cars. Pent-up demand is driving sales, as is the expiration of two- and three-year leases. Interest rates are at historic lows, and credit is more readily available. Hiring has picked up, giving people more money to spend. Hourly pay has risen faster than inflation the past three months. Many automakers have exciting new vehicles to choose from, both trucks and fuel-efficient small cars. Schuster says sales probably hit an annual rate of 15.2 million cars and trucks in February, which is normally a lackluster sales month. The TrueCar.com auto pricing site predicts 15.7 million, which would be the best February performance since 2007. Sales are still short of the recent peak of near 17 million in 2005, but they're healthy now compared with the anemic 10.4 million recorded in 2009. Matt LaFontaine, general manager of the LaFontaine Automotive Group, an 18-franchise chain in the Detroit area, said all of his dealerships that sell Detroit-based brands will beat their projections for the month. "The biggest thing for us is just making sure we have enough product on the ground." Customers, he says, "are ready to make a move." LaFontaine said the budget debate in Washington hasn't cut into auto sales. Congress and President Barack Obama aren't likely to reach a last-minute agreement before $85 billion in automatic government spending cuts kick in Friday. Higher gas prices also haven't hurt sales, evidenced by the growth in large vehicles like pickup trucks. The average price for gas rose 36 cents per gallon in February to around $3.78 per gallon. Consumers have also shrugged off higher Social Security taxes, which cut take-home pay starting in January. For a household making between $70,000 and $100,000 per year, it cost around $300 per month, which is close to a car payment. Barclay's analyst Brian Johnson said the tax increase has had little impact on new-car buyers, but it may hurt used-car sales because those buyers are more price-sensitive. Automakers are spending less on discounts and deals, which cut into their profits and brand image. Discounts in February averaged $2,392 per vehicle, down almost 4 percent from a year ago, TrueCar said. But low interest rates are offsetting that, LaFontaine said. The average four-year auto loan has a 2.5 percent interest rate, according to Bankrate.com. That's about half of what it was five or six years ago. On a $20,000 loan, that means a monthly payment of $438, down $23 from a 5 percent loan. 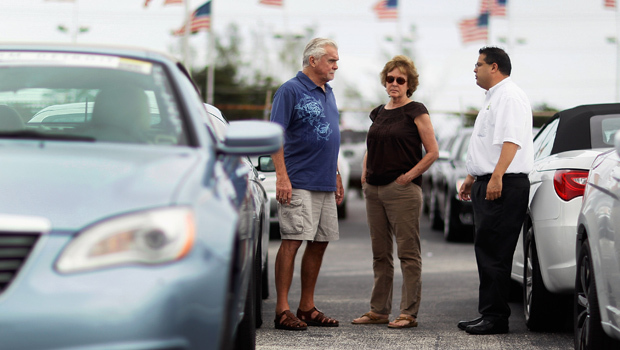 Plus, automakers offer subsidized loans to spur sales, many with no interest. And some consumers have no choice but to buy. The average vehicle on U.S. roads is a record 11.2 years old. Many car buyers are being forced to replace aging vehicles after hanging on to them through the Great Recession.